If you have a quick question for our support techs that does not require a remote connection please click the 'Live Chat Only' button below. If the tech cannot provide a solution through chatting, they will move your session into the queue for remote support. Your Company Code can be found on the bottom of the Main Module screen in the lower right-hand corner. Enter your call back phone number. Why are you contacting support today? 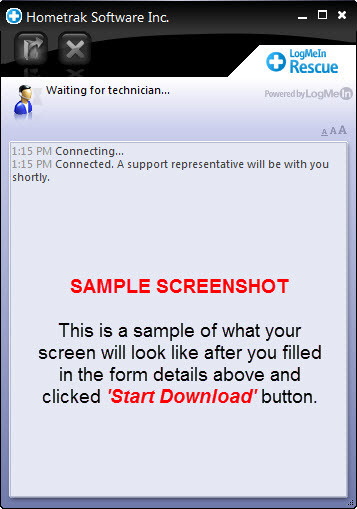 Examples: Payroll, Installing software, or Mobile Apps etc..
Next, click Run to download the applet. The applet download should take about 15 to 30 seconds. Then, click Run to execute the applet. Once you are connected to our Technical Support queue you will see the screen to the left. This screen indicates that you are now connected to our support queue. Just think of it as being on hold waiting for the next available Technical Support Representative to pick up your call. Do not disconnect this session and restart. Doing this will move you to the end of the queue! If you have been waiting for a period of time this means we are experiencing a large volume of calls. If you have already connected into the support queue, please do not call and leave a voice mail message as well. HomeTrak customers with questions about or looking to switch to ClearCare, please email conversions@clearcareonline.com.